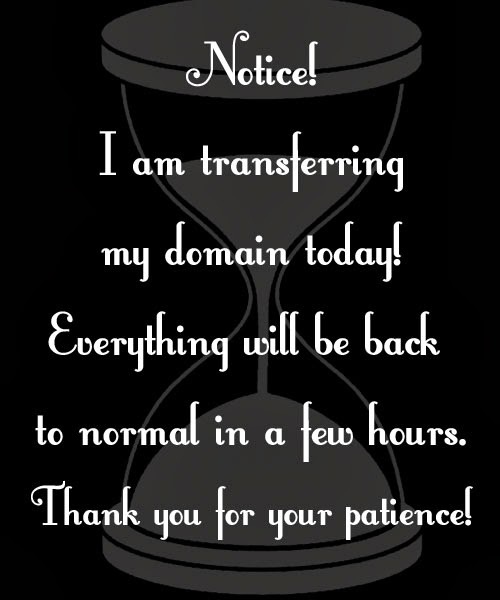 The CoffeeShop Blog: Domain transfer! Update at 2:00 PM, Central Time. My blog is showing up at www.thecoffeeshopblog.com in most browsers, so hopefully in the next few hours everything will be completely back to normal. Thank you for your patience! I will be posting a new action today if all goes as planned. I am transferring "thecoffeeshopblog" domain to GoDaddy today, so if you are having issues seeing my site try refreshing the page. Everything should be back to normal soon! Thank you Kristan!!! Slowly but surely. Hopefully everyone will be able to get on by this evening. What a pain this has been. Works in Firefox too. Good luck! Thanks peabea! I will figure out what is going on since I have it set up properly through Blogger. I think it is something I have to change on GoDaddy.